Mother’s Day is finally around the corner, and as every other son should do, you want to make the day memorable for your mother that sacrificed so much for you to reach your current heights. Do not get yourself beat up over finding the perfect message to send to your lovely mom because we painstakingly created an archive of sweet Mother’s Day message to choose to make her feel like the princess that she indeed is. 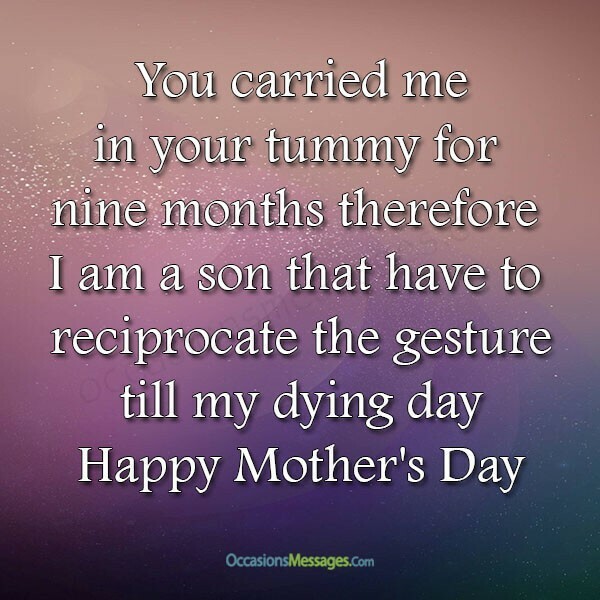 You carried me in your tummy for nine months therefore I am a son that have to reciprocate the gesture till my dying day. Happy Mother’s day. My wish on mother’s day is that my future wife will imbibe the lovely characters of my beloved mother; I would love my kids to have someone like you as a mother. It is not surprising that nobody argues about the best mother to a son in the community because we all know it is you without any doubt. Every son needs a mother for advice and an undivided loyalty, you offer more that is why I decided to cancel today’s activities and spend mother’s day with you. I want my children to enjoy as I did as a small boy, so I pray that you live to spend many more mother’s day celebration with us your family. Happy mother’s day. The impact of a mother in a son’s life is essential because only a mother can love genuinely next by his wife and friends. Caring for a mother is every mans responsibility so you can count on me for anything for today just relax and trust me to handle everything for mother’s day. To be a grateful son, I have to show to the world on mother’s day that I have an outstanding woman as a mother. If only all women can be like my mama. If I have female children I will convince them to be good and virtuous like their grandma. You are perfect since I was a little boy till today’s celebration of mother’s day. Boys like me need a mom like you. You are so caring and loving. Happy mother’s day. I love you so much. You still look as young and ageless as last year’s mother’s day, whenever we walk past people strangers think you are my elder sister, it is so sweet. I will cherish the moments we have together, I can’t imagine myself spending mother’s day without you my wonderful mother. The safest place for me is with you despite being a boy but nevertheless you still own the mother’s day celebration, so I am happy to spend beautiful time with you. The possibility of not making my beautiful mother smile on mother’s day is zero. As a decided son, my mom’s happiness should be the main order of the day. Even cupid’s arrow cannot have the same effect on me as your love; you are my mother and like a sister and a wife respectively. Happy Mother’s Day. Mother’s Day is about extending our appreciation to our beloved mothers who are the primary source of our life. As your son, I say thank you. I will not wait until you grow old before I do the needful on mother’s day. I am a man, so I will send you a thousand flowers if it makes you happy. There is not a thing that I would not do to show you how much you mean to me; Mother’s Day will be a show of gratitude from me, your son. I will buy you a thousand more years if I could, but money cannot buy everything; nevertheless, I will get you a substantial gift Mother’s Day present. Congratulations on another outstanding Mother’s Day celebration. Thank you for giving your lovely son the chance to please you. I enjoyed the day. Lovely mothers are in different packages, l found the best bag in you, I wish I can marry someone as understanding as you. Happy Mother’s Day. I know that you are proud of me as a son as I am also grateful to have you as my mother on Mother’s day. Mama, you are just the best. I feel like spending all of today with you, so I can show you how a son should treat his mother on mother’s day. Women are more important than men in the circle of life, I promise to treat my wife with the same care and compassion you taught me. I am so glad for many things like being your son and your teachings that are of wisdom. Have an outstanding Mother’s Day with me in it. Happy Mother’s Day, you lead by example, and I still come to you for guidance even though we are far, but as my mother, you did well over the years. I owe you eternal gratitude on mother’s day for being my mother, I was a stubborn boy, but you showed me the path of peace and contentment. God knew I need a strong mother, so he blessed me with you. I have all the confidence that we will live to see more mother’s day as mother and son. Happy Mother’s Day dear mama, you proved that women are important as men. It is possible for me to be in a tight position if not for your timely counsels. You taught me that men need to hustle hard to provide for the family and that only teaching gives me an edge other my friends. Thank God for mother’s day. No matter the height of wickedness of a mother to a son they deserve respect, so I will celebrate you on Mother’s Day while I can still see you. Happy Mother’s Day to you my dear mummy, May heaven keep you long enough. Have a very happy day. You never gave up on me as a son, so I will never stop being excited for having such a sweet mother like you. You are the queen of the Mother’s Day. I am a boy that always wish to have a daughter that will take after you. You are outstanding from other women on mother’s day. A million shootouts on Mother’s Day to a woman of integrity, virtue, and excellent reputation. Sons cannot wish for a better mother. My mother is sophisticated and classy; I guess you passed it down because girls love me at first sight, so I will bring some to celebrate mother’s day with you. A mother’s blessing is all I need, and you did it uncountable times already. You continuously seek my progress. Happy Mother’s Day. I cherish Mother’s Day memories that we shared and today are another, being a son to you is a fantastic experience that I would not trade for riches. May your mother’s day be full of joy and prosperity since you have always kept me happy as your son. God will surely reward you for your commitments. I love you more than everyone else because you are my mother and you earned a right for a son to celebrate on mother’s day. Happy Mother’s Day to a woman that scored high score in parenting; therefore her work is worthy of recognition on mother’s day. I love you so much mom, your son. I hope that your mother’s day celebration will be bright like the sunshine. You are my mom and my champion. Have a beautiful day. You have a spear key to my heart, and I permit you to use it as you wish. The mother and son bond that we share is phenomenal on mother’s day and after. This entry was tagged Happy Mother's Day, Mother's Day Messages from Son, Mother's Day Wishes from Son. Bookmark the permalink.